The project is expected to have of duration of 12 months from its beginning, with additional 6 months for the project’s report and outputs. 1. Only proposals submitted by member schools of EASSW will be considered and all participants in the proposed project must be members of EASSW. Members of EASSW include faculty members of schools who have paid their membership fees in the current calendar year. Individual members, who have paid their dues for the current calendar year, may be considered at the discretion of the committee. 2. 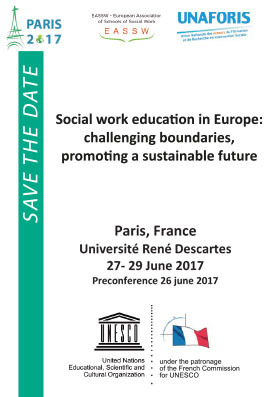 The project has to be truly international, involving at least five EASSW member schools of Social Work from at least three countries. A diversity of cultures or systems of social work education are suggested, as well as inclusion of schools of social work in countries where social work education is facing particular challenges. 3. Priority is given to those project proposals, whose partners have not received EASSW project funding during the last two years. 4. The Members of the Executive Committee of the EASSW cannot be coordinators of a project proposal. 5. The proposal is creative and innovative. A Project Working Group (PWG) consisting of members appointed by the Executive Committee of EASSW will review proposals. The recommendations of the PWG will be presented to the Executive Committee for ratification at meetings twice a year. The Chair of the PWG will notify the designated contact person of the Project Panel’s decision within a month of ratification. - 70% when the proposal has been approved, and the chair of the PWG has been notified that the project is about to be implemented. - 30% after the submission and approval of the final report. Consideration of final report will be given by the PWG. The designated contact person will be notified of the PWG 's decision within about a month of ratification by the Executive Committee. -	An account of expenditures. Furthermore, one copy of any materials created as part of the project should be attached, and a link should be provided to materials available on the internet. Material should be presented in a form which can be added to the EASSW website. The final reports will be published on the EASSW website. EASSW must be mentioned in any publication based on funded projects. The projects are encouraged to use the website of EASSW for sharing their progress and results instead of developing a website themselves. The projects are encouraged to inform about News and Results of their work in the EASSW Newsletter.